This Dutch gable roof is the perfect partner for a heritage bungalow. Not only does it replicate the existing gables on the main house, it minimizes the visual impact of the carport itself. A Dutch gable is essentially a hip roof with a small gable at the top. The slope of the hip at the front of the roof is less visually assertive than an upright or vertical gable. Dutch gable roofs are slightly more expensive to build due to the extra timbers involved in the framing but for a discreet and harmonious look you can’t go past the Dutch gable. Like all roofs, they are at their best when correctly proportioned; height for width of span, angle and pitch of roof. This one, by Ben and Vanessa O’Callaghan of Outside Concepts South East Perth branch is constructed in timber and sheeted with Zincalum. It features the best of design and construction. For carefully planning and design you can’t go past Outside Concepts. 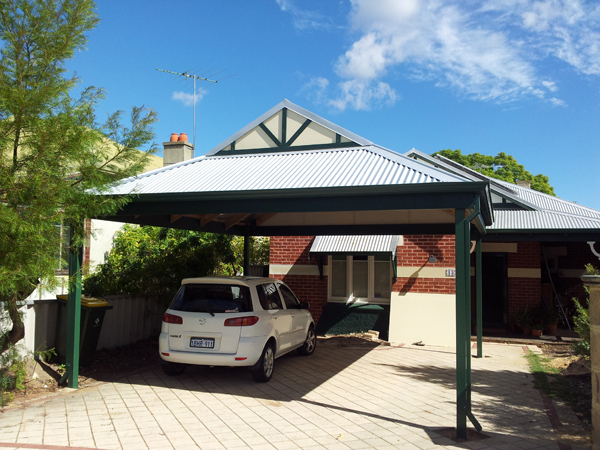 We specialise in outdoor design and construction – if you’re thinking of a deck, pergola, patio, carport or Dutch gable roof to suit your bungalow, call Outside Concepts South East Perth (WA) today!